If you have a Jeep, sedan, pickup truck or SUV this is a the best backup camera for you. Dark Tint - This tint shows the backup camera more than the mirrors reflection. Its darkened so you can see the LCD screen better. Light Tint - This barely has any tint so you get a regular looking fully reflective surface and it looks exactly like any other mirror. as a result it is a little harder to see to see the LCD screen. 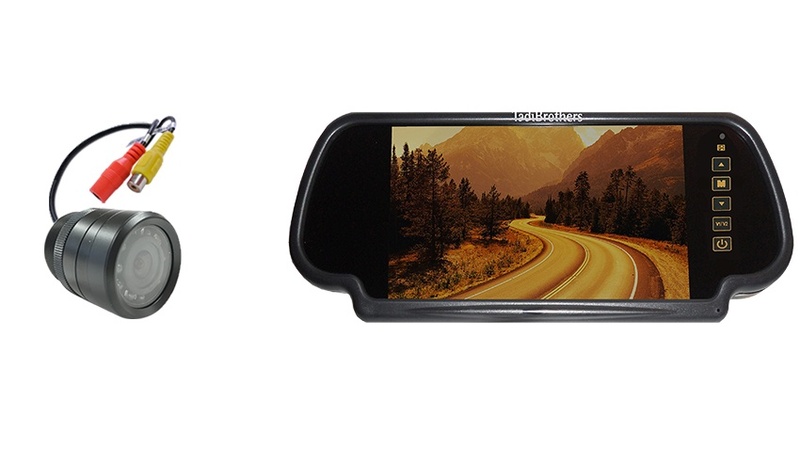 7-Inch Multimedia Rearview Mirror (flip up panel)-This clip-on mirror features a full touch screen with an SD Card slot and USB input that allows you to watch movies from any source. This monitor still has all the standard features of our regular mirror such as 2 inputs and a special glass that shows you the LCD screen when you’re using the backup camera but looks like a fully reflective mirror when the camera is off. This Mirror also features built-in Bluetooth standard that allows you to make and receive calls with your mobile device. 4.3-inch Full mirror replacement-This is a full mirror replacement that has a 4.3-inch LCD screen built into the mirror face. The rest of the face is a regular mirror. This mirror has a special glass that allows you to see the LCD screen only when it is getting a signal from a backup camera. When it is off the entire face looks like a regular mirror. This is called a “full mirror replacement” because it comes with A universal arm bracket that will attach to your windshield like the stock mirror. 4.3-inch Dual Screen mirror- This rear-view mirror clips onto your existing stock mirror and features 2 LCD monitors that allow you to see 2 cameras at the same time. The LCD monitors are built under the mirrored glass and when not in use the face of the mirror looks like a standard mirror that comes with your vehicle. 9 to 10.2-inch Clip on mirror- This series has the largest LCD mirrors available. The LCD screen under the mirror takes up the entire face of the mirror. It is perfect for those who want to use their mirror to view their backup camera continually while driving. When the mirror is off or not getting a signal it’s special glass will look like a regular mirror hiding the large LCD panel behind it until the next time you turn it on. This includes a remote control. This mirror has the optional upgraded to 3 or 4 channels with a split screen. The Flush mounted bumper backup camera is great solution for those who want seamless look of the backup camera on their vehicle. The size of the camera is 1-inch diameter and 1.5-inch length, it comes with adjustable cylinders that let you change the positioning of the camera to get the perfect view. Even though this is a small camera it has some big features, like all of our backup camera it will comes in full color and its 100% waterproof it also has the auto night vision which progressively activates the night vision the darker it gets outside. This bumper camera comes preconfigured with a viewable angle of 120 degrees but it upgradable to a 170-degree wide angle view for seeing up to 3 lanes behind you. The camera is also able to activate only when you go in reverse like when you are parking or have it left on continuously while you are driving down the road, this is very useful for when your changing lanes. Finally, 2 other popular options are the CCD High Definition upgrade and the gridlines. When upgrading to CCD you make your daytime picture more vivid with Hi-Definition colors and it enhances the night vision to make the night time video as nice as the day time. All of the above changes can be made by use the “Customize and Upgrade” section at the top right of the page. Note: if you have a system made by Furrion, Weldex, Voyager, Clarion, Sony, etc. that system can be adapted to work with your existing wiring or fit in your existing housing with our universal adapters. After you put your system in the cart, search the name of the manufacturer (i.e. Furrion) in our search bar and then add those adapters to your cart (usually the camera and monitor each require an adapter), if you need help or advice don’t hesitate to call us.
" I have a private fleet of 14 ambulances I purchased one of the systems to tested and that guy and the sales rep suggested I try the mirror system first. So I ordered one system with a 7 inch mirror and I've been using it for three months I'm very satisfied with it it doesn't take up – space and the images absolutely amazing I was also pleasantly surprised to discover that I can even connect the second camera so what I did what is I ordered another camera to put in the front now my system is complete and after four months of testing it I'm ordering for the rest of my fleet. I am very happy and also they got me a fleet sale discount. "